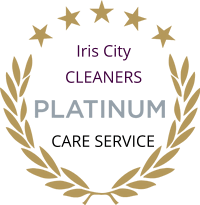 Platinum Care Service is our own custom process developed by Iris City Cleaners over the years for the care and finishing of fine garments. We realize your extra-special garments are an investment and demand special care. Specialized proprietary buttons are removed and sewn back on after cleaning, if needed. If we suspect that any part of your unique item will not withstand a process, with your authorization, we may remove that part and, after cleaning replace it exactly as it was before. Each unique item is placed in a specialized non abrasive bags on a special cleaning cycle to ensure gentle and thorough cleaning. We use only garment safe and environmentally friendly additive in our processes. Garments are finished on a European Finishing Equipment, which allows us to press a garment on a "cushion of air", alleviating seam impressions and poor finishing characteristics. The French and Italians finishers have for years been using this type of equipment. Our own 10-point inspection process for Platinum Care Service was developed to insure a return to retail condition with an impeccable presentation from protective cover to body ready-to-wear garment. Inclusive of superior cleaning and finishing, buttons re-in-forced, loose threads removed, snags repaired, de-linting of garment, boutique hangers, minor mending or repairs, expertly packaged with high-grade tissue, bagged separately to alleviate wrinkling in travel, placed carefully in your transport vehicle or delivered to your door, and of course, lagniappe. All intended to represent the finest presentation we can imagine.